With dynamic art, interesting health science examples, and coverage of the latest issues, it's easy to see why this book is a bestseller! 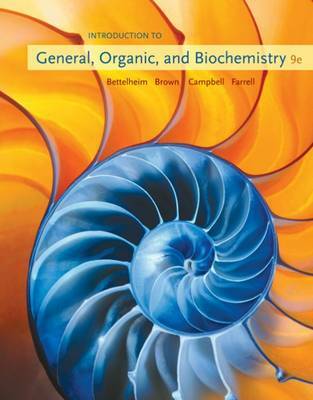 You'll quickly gain a comprehensive understanding of chemistry with INTRODUCTION TO GENERAL, ORGANIC, AND BIOCHEMISTRY, 9th Edition-the authoritative book that uses real-life applications and interactive technology tools to help you see how chemistry relates to health science. As you explore topics such as botulin toxin as a cosmetic agent, implications for the use of antibiotics, the Atkins diet, and ultraviolet sunscreen, you will quickly see how useful the study of chemistry is to so many aspects of your life. The book's built-in integration with OWL (Online Web-based Learning) turns your study time into experiences with chemistry-building your comprehension and bringing the concepts to life.